Reur 451, it wasn’t complicated, it was vague. which simplifies even further. These conceeptual models are based on the physics but certainly do no attempt to include everything. My, but what a creative interpretation. How are dem cherries? 3) Tamino only considers “volcanic forcing” plus CO2, yet attempts to show a fit with GISS temperatures with bad data. 4) Some sources have attributed sulphate emissions reductions in Europe and USA to have had a significant effect. 5) Some sources have attributed ENSO etc to have had a significant effect. The Mauna Loa data are not relevant to volcanic forcing–the altitude is not high enough. The volcanic forcing Tamino uses is standard. If you don’t like it, perhaps you could propose another time series? Tamino has looked at ENSO (and volcanism) elsewhere (in December). Oh, look, exactly what you’d expect. OK, Bob, repeat after me: It’s a model. You use it to look at whether a particular forcing is important. Tamino’s goal was to show volcanism was part of the answer for 1910-1940 (and did so long before Jones was asked the question). My, but what a creative interpretation. How are dem cherries? You have also advised me that I should not rely on historical records, (incl photos etc), but should check out the statistics. The only relevant data I can think of that goes back a good way is the Oz BOM rainfall record which I would have thought is a good indicator. It clearly shows regional variations but with mostly much drier conditions for the whole ~45 years following 1900. (the start of records). Where there some other statistics that you had in mind that I should check? I believe the cherry harvest in Victoria was good again this year. What was your point? BobFJ (455) — Obviously you didn’t bother to look at the links I provided. I know this because the second is to a comment of mine, not Tamino’s. I suggest studying both rather closely; the latter uses decadal averages, in effect removing ENSO and solar cycles. Now just using CO2 forcing, R^2=0.96. With AMO added, R^2=0.99. By definition, essentially, whatever secular trens in various forcings do not contribute to the linear trend in North Atlantic SSTs then show up in AMO; volcano emissions, inductrial emissions, etc. The Mauna Loa data are not relevant to volcanic forcing–the altitude is not high enough. The volcanic forcing Tamino uses is standard. If you don’t like it, perhaps you could propose another time series? http://tamino.wordpress.com/2009/12/31/exogenous-factors/ Oh, look, exactly what you’d expect. OK, Bob, repeat after me: It’s a model. You use it to look at whether a particular forcing is important. Tamino’s goal was to show volcanism was part of the answer for 1910-1940 (and did so long before Jones was asked the question). Now that IS a surprise! I was actually wondering if DBB might respond with “it is too high at over 3,000m”, given that quite a lot of the Earth’s surface is at or near sea level. The response to volcanic emissions, no matter what their altitude, is instantaneous at the surface in terms of reduced insolation. (This effect can be compared with shadow, seen whenever any object passes in front of the sun). My understanding is that the heavier particulates, (e.g. dusts, depending on type of eruption), may descend to the surface relatively rapidly, grading off to towards the aerosols that may be suspended for up to about 3 or 4 years. Thus, it would be better to have observations near the surface. Another difficulty is that rapid descent of dusts may not result in their global mixing or proper local detection. Out of curiosity, I Googled ‘standard volcanic forcing’, but couldn’t find anything. Do you know where Tamino gets his standard forcing from? Whatever, I don’t like it because Mauna Loa shows only two large down-spikes after 1960, whereas Tamino gives three of a different shape/distribution. BTW, Tamino does not label the events, whereas ML does. I cannot “propose another time series”, can you? This is not the article that you cited, and that we are discussing. I had a quick look to see if your new distraction carried the usual Tamino invective, and it does, so I didn’t read it. OK Ray, repeat after me: It is very naughty to make a conceptual model with apparently wrong data and significant missing parameters and then use it to show a fit with surface temperature data. Tamino’s model consequences for two large eruptions ~1885 & ~1905 were part of the answer for the 1910-1940 warming? 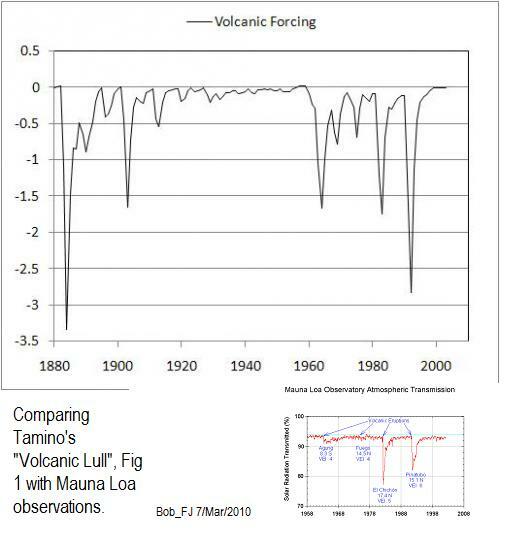 I forgot to ask, but since you assert that Mauna Loa has insufficient altitude to determine “volcanic forcing” effects, and you say that Tamino uses “standard volcanic forcing” way back to 1880, at what altitude was it determined; how; and by whom? Most aerosols in the troposphere are going to rain out pretty rapidly. It’s the stratospheric aerosols that have the dimming effect. Bob, you clearly haven’t done much modeling. You model a phenomenon to elucidate what the contribution of its factors might be. In most physical models, you don’t have so much interaction between parameters that simplification invalidates the results. In ecology, this is, of course, not always the case. Sorry, but the reason I did not open yours was that the Tamino article starts with the word ‘Denialists’ and so on, and I rapidly lose patience with such stuff. I should have been more patient and looked at yours! Sorry. Nevertheless, the issue that set this exchange off is about a Tamino article that Ray cited, which I submit, has substantial problems which are NOT just about modelling. I guess it’s reasonable that other and more recent modelling is better than the modelling aspects in the original Tamino citation, but discussing such improvements would be a distraction. You expressed an interest in seeing what the issues are in your 437, but I‘ve not yet fully covered them. This is one reason for avoiding such distractions. which includes volcano forcings along with other factors. What I will defend as based on the physics is his two box model and despite the off-putting wording therein, the link I provided for you is worthy of attention. It appears that the graphs you are trying to compare measure entirely different things. One is net solar intensity, the other is global mean effective forcing (from stratospheric aerosols alone). It disturbs me that you were unable to find the source for Tamino’s data, given that he provided the link to the actual GISS data right in the text, right above the graph. You had time to make a graph comparing apples to oranges, but you didn’t have time to read what Tamino wrote? That’s a dangerous trap. Graphs alone don’t tell you everything. Read the discussion! And don’t make accusations when they are clearly baseless! If you are unsure why there is a difference, or you can’t find a source, ask politely instead of making wild and extravagant claims. Perhaps after a glass of Cabernet-Merlot I’ll have a go with your recommendation, but to repeat, There are other apparent problems that I’ve not come to yet. BobFJ: It appears that the graphs you are trying to compare measure entirely different things. One is net solar intensity, the other is global mean effective forcing (from stratospheric aerosols alone). This is a quickie: I’m mystified why you qualify volcanic forcing: from stratospheric aerosols alone. For a start, how and why would tropospheric dimming be excluded, when the substantial down-spike of typically around a year is suggestive of the lower levels and can be measured from the surface? Aerosol forcing is predominantly due to sulfate aerosols. These are reactive and precipitate out on a timescale of weeks to months. As to Tamino’s analysis, you seem to have utterly misunderstood it. The GISS volcanic forcings are INPUT to the model. What Tamino shows is that you get a reasonable match to the temperature data if you take into account both the prompt (atmospheric) response and the slower (oceanic) response of the climate. Methinks you would do well to spend more time trying to understand before you jump to conclusions. I’m sorry that I misunderstood the first GISS reference, which was irrelevant, and maybe as a result of that I skipped or missed the second GISS item. (See also my 465). BTW, I’ve noticed a few strange things in the latter tabulation, which I’ll study a bit more yet. The former is presumably based on estimated information and shows that the Agung eruption is of about the same forcing (dimming) magnitude as El Chichon, whereas Pinatubo is much greater in magnitude. However, the Mauna Loa empirical data shows the relative magnitudes of El Chichon and Pinatubo to be reversed. Also the ML empirical data for Agung is slight, whereas it is huge per GISS/Tamino. BTW, have you heard of Agung before? Not me, but the other two certainly yes! And not point source data. You get results that depend on the location of the volcano _and_ the measuring stations. Look at the distribution of Pinatubo’s aerosols. See why picking only Mauna Loa will give you a different chart than taking measurements globally? See why using just Mauna Loa gives you wrong numbers to _apply_ globally? Incorrect presumption. You can look this stuff up for yourself. But as several people have pointed out, you don’t get information about the effect on global climate from just one source, not even that one. You might as well be picking just one thermometer location and be claiming you’re getting good information about the effect on climate. Data, again, is taken from multiple stations, e.g. As to Tamino’s analysis, you seem to have utterly misunderstood it. The GISS volcanic forcings are INPUT to the model. Obviously Tamino has input some global forcing numbers, which I’m trying to show, are a bit sus’. He also inputs CO2, but he fails to include other parameters. What Tamino shows is that you get a reasonable match to the temperature data if you take into account both the prompt (atmospheric) response and the slower (oceanic) response of the climate. Hank Roberts, thanks for your series of comments. Good work! but I’m about to start my weekend, and I doubt if I‘ll have much time. At a quick flick through, I was impressed by this graphic of Pinatubo’s emissions, although it is not given if it was a snapshot in time or some average over a period. The big latitudinal variations in concentrations etc, suggest that it would be necessary to use time-series data in grids around the planet, with some very complex integrations to get a complete picture of global dimming and mixing by region. Thus the use of an alleged global average by Tamino puts his modelling into further questionability. BobFJ (473) — A more interesting three box model would be (1) air + top few meters of the ocean (2) shallow ocean (3) deep ocean. Tamino does the first two and the relaxation time for the third is so long that we can ignore it for such conceptual studies. You’ve backpedaled from wrong presumption directly to insinuation. You don’t even know whose work you’re calling ‘suspect’ — even though it’s been cited twice in the last few days and you’ve been given pointers and pictures. I gave you a better source. You didn’t read even the caption on it, eh? The volcanic forcings are standard. And as I say, Tamino has looked at volcanic + ENSO elsewhere. You would do well to peruse some of his analyses. Re your 3 layer model: I don’t think land surface temperatures would add all that much. Heat flows pretty slowly in the solid Earth. However, if you were interested in pursuing this, you could look at borehole measurements. Whoops, sorry, you’re right, I should not have used such sloppy language, but rather the more scientifically correct substantial uncertainty. Do you find it difficult to understand what I wrote as follows? BobFJ, The volcanic forcings are standard. And as I say, Tamino has looked at volcanic + ENSO elsewhere. You would do well to peruse some of his analyses. Ray, we are discussing the Tamino article that you cited and supported. He and others may well have some improved models but they are distractions to the original. I think you would do well to peruse the uncertainties in volcanic forcings that have been expressed elsewhere, such as in the links given by Gavin above. You seem to be afraid of uncertainty–as if having uncertainty in a forcing estimate invalidated it. The forcing Tamino used is a standard. The results he get show that the low number of volcanic eruptions in the 1900-1940 period likely contributed significantly to thewarming observed in that period. Now you can reject that analysis if you please, but no one is going to take you seriously unless a)you present an analysis showing deficiencies in what Tamino presented, or b)you present an analysis of your own showing the contrary. Until that time, as I said, you would do well to look at some of the analyses I and others have cited, because it is clear that you are arguing mainly against straw men of your own construction–and astoundingly, still losing. BobFJ, You seem to be afraid of uncertainty–as if having uncertainty in a forcing estimate invalidated it. The forcing Tamino used is a standard. It may be the best estimate available, but Sato et al opine that the uncertainty is large, prior to 1990. Thus for Tamino to use this data and to exclude other relevant parameters, (without explanation or caveat), and then claim a fit with GISSTEMP, is an academic exercise with zero merit, and is likely to create misunderstanding. The results he get show that the low number of volcanic eruptions in the 1900-1940 period likely contributed significantly to the warming observed in that period. Well, amongst other things, and keeping it simple, please study this composite graph , and explain why in the period 1940 to 1960 there was rapid cooling whilst low volcanic activity continued, as it did from ~1910 to 1940. This belongs over at the “Close Encounters…..” thread, if you would like to get people to shake their heads wondering why you keep citing stuff that is irrelevant to the debate. Whilst you are there, perhaps check-out Doug Bostrom’s 972, and a gem from Jedda; 978. You seem to be trying to attribute all climate to volcanoes today. I thought we got past this idea that climate only has one driver? More than two drivers, as well. Yes, that particular Tamino post only looked at volcanoes and greenhouse gases, but Tamino has hundreds of other posts, you know. And your “without explanation or caveat” jibe is just low – and wrong. Tamino said explicitly: “This is of course a simplified model, which can’t be expected to be as realisitic as general circulation models.” As for explanation – the whole post is explanation! Take your snark elsewhere, please. You keep trying to make these conversations into debate — ‘debate’ about Tamino’s topics. Education is furthered by asking open questions, doubting one’s own ideas, looking for more information. You can’t do those and win a debate. You’re using your debating tactics to dismiss anyone who’s trying to learn. Debate isn’t learning. It’s arguing just one side instead of learning. In your own mind perhaps you “win” — you’ve found a place you can keep posting your confusion about what’s explained at Tamino’s. You’re making your confusion everyone else’s problem. Are you learning anything? So, why start the smoothed line at 1920? Should it not be 1895, enabling 15 years of data each side of that target year? (or, if he’s doing a PMA smoothing, (?! ), should it not be 1930? See this composite graph for more detail on this, and on several other questions that can be asked. For instance, between 1915 & 1960, the volcanic forcing is approximately zero, yet Tamino computes a continuous temperature rise well beyond his 30-year lull hypothesis. Are you posting all these criticisms of Tamino here because you have failed Tamino’s “stupid threshold”, and he no longer allows you to post at his site? If not, why not address these questions to him directly? Although personally, I still believe all your questions are answered by actually reading what he wrote. Failure to understand something is no crime. Your accusatory tone, however, is just rude. So, why start the smoothed line at 1900? Should it not be 1885, enabling 15 years of data each side of that target year? (or, if he’s doing a PMA smoothing, (?! ), should it not be 1910? for more detail on this, and on several other questions that can be asked. For instance, between 1915 & 1960, the volcanic forcing is approximately zero, yet Tamino computes a continuous temperature rise well beyond his 30-year lull hypothesis. warming continues past 30 years (due to other forcings; links provided). If you managed to ask an interesting question, you’d get some response from the scientists. So far you don’t seem to be getting it. It [the GISS volcanic forcing] may be the best estimate available, but Sato et al opine that the uncertainty is large, prior to 1990. Thus for Tamino to use this data and to exclude other relevant parameters, (without explanation or caveat), and then claim a fit with GISSTEMP, is an academic exercise with zero merit, and is likely to create misunderstanding. Well actually I did ask tamino as you and Hank have suggested, but it was deleted without comment. It was the only time I’ve commented there. 1) I presumed volcanic forcing back to 1880 was estimated because it is obvious that good empirical observation would not have been possible. 2) What you may not realize is that time-series smoothing should use CMA or centred Moving Average methodology, so that in the case of a 30-year smoothing, for any target year, 15 years of data are needed before and after that point; not 20 years. On the other hand, if PMA was used, apart from the fact that it is unsuitable for time-series, 30 years Prior to the target point is required; not 20. 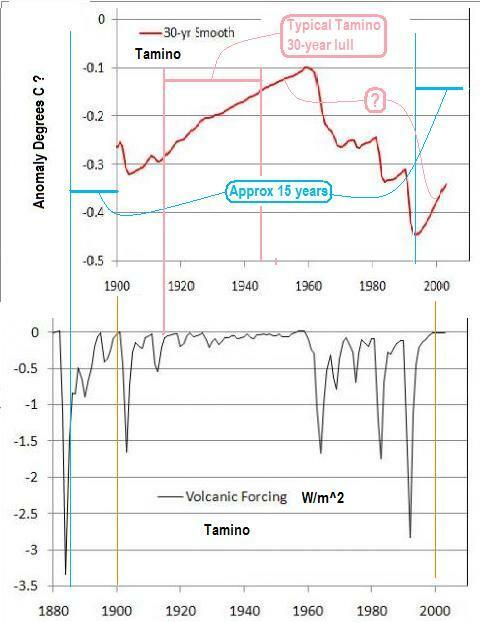 3) According to the text, Fig.3 is a 30-year smooth of volcanic forcings only, so you have not explained why the temperature continues to rise beyond the hypothetical 30-year lag of the only forcing portrayed.